The faithful who are ill or home bound, are deprived of their rightful and accustomed place in the Eucharistic community. 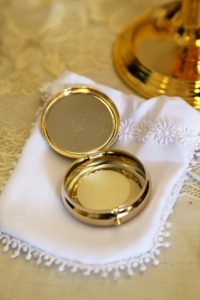 In bringing communion to them, the Minister of Communion represents Christ and manifests faith and charity on behalf of the whole community toward those who cannot be present at the Eucharist. For the sick and home bound, the reception of communion is not only receiving Christ, but also a sign of support and concern shown by the Christian community for its members who are unable to gather together. What does serving the Home bound entail? It is a generous decision to distribute Holy Communion to those who are ill or home bound. The Coordinator and the Volunteer minister work alongside of the home bound faithful to determine a good day of the week and time for a weekly visit (or less frequently if they request it) and distribution of the Eucharist. The Volunteer Minister will receive training that entails how to administer a short “Communion Rite for the Home bound“. This consists of short prayers, recitation of the weekly Gospel, and distribution of the Holy Eucharist. The visit can take anywhere from 10-20 minutes. The Volunteer Minister will be asked to become a Commissioned Minister of Communion if they are not yet one. Those who desire to share the Eucharist with home bound brothers and sisters are invited to contact the Parish Office for further details and training. Additionally, if you have home bound family members, please contact Sarah Nelson at 719-542-9248 ext. 121 so we can best serve your family further.